Prior to the formation of the Society in 1852, Woodbridge had been renowned for its Horse Fair which was held each year on the meadows leading down from the Crown Hotel to the river. A rural area not only produces horses and animals but garden produce, and as time went on, displays of vegetables and flowers were added to the Fair. 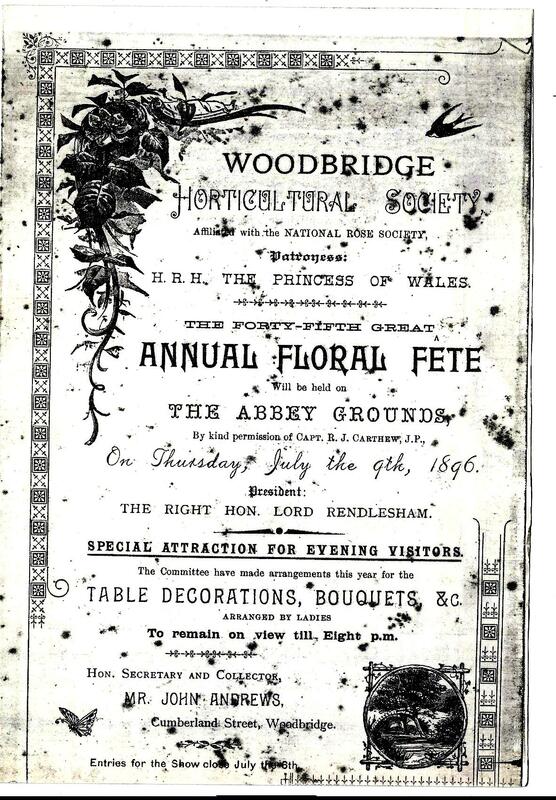 The horticultural feature of the show was so popular, that in 1852, a group of people headed by Mr John Loder decided to form the Woodbridge Horticultural Society and Mr Loder became its first secretary. 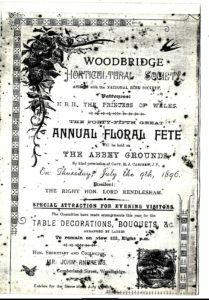 Early Flower shows were held in the grounds of the Abbey and attendance at the 1859 show was recorded as over three thousand! The Society celebrated its Silver Jubilee in 1901 and it was reported that entries for the show came from as far afield as Rothsay in Scotland, Covent Garden and Highgate. Military bands and fireworks were regular features at the shows. Following the two world wars, the cost of staging such spectacular shows became prohibitive, so the Society concentrated on the prime purpose for which it was formed: To promote an interest in horticulture.